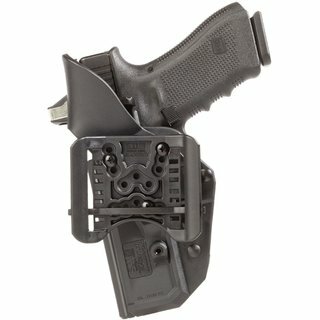 Das Thumbdrive Holster ist eines der sicherstes und gleichzeitig schnellsten Level II Holster, die derzeit auf dem Markt erhältlich sind. Es besitzt unsere exklusive Daumentastensicherung, welche die Waffe in allen Situationen zuverlässig arretiert. Engineered to be the quickest and safest Level II Holster in the world, the 5.11® Glock 17/22 ThumbDrive Holster® was created in partnership with Blade-Tec® and field tested by Viking Tactics®. With our proprietary single-thumb retention and release system, the Glock 17.22 ThumbDrive Holster gives you a safe and natural release, while the removable Chop-Block? switch guard provides added weapon retention characteristics. The ThumbDrive Holster system allows completely user-defined placement and draw angles, and our optional Drop/Offset and Thigh Rig kits (sold separately) allow additional customization for maximum comfort, speed, and safety.